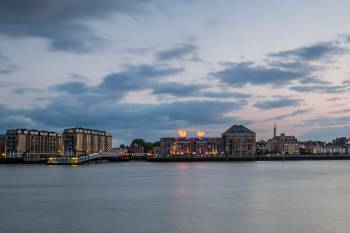 The DoubleTree by Hilton Hotel London – Docklands Riverside is located near the Canary Wharf business district and many world-famous attractions – ideal for corporate travellers and weekend adventurers. Take the hotel’s complimentary ferry to Canary Wharf Pier for easy access to the Thames Clippers river bus service and other public transportation.Guest rooms feature a flat-screen LCD TV, opening windows and tea/coffee facilities. Most guest rooms also boast city and river views. Business travellers will appreciate the laptop-sized safe, large desk and 24-hour room service. Choose a suite for a separate living area with sofa bed – perfect for families. The DoubleTree by Hilton Hotel London – Docklands Riverside provides the space, style, and personalized service that Guests want and expect when planning an event or meeting. From grandiose galas and meticulous meetings to private parties and social soirées, every special occasion is our main event. Select this amazing river side location as the site for wedding nuptials, or choose a BBQ on the Terrace. Conduct board meetings for three or stage a black tie gala for 300 Guests. Relax and let experienced Team Members oversee every detail from start to finish for a seamless success.